Very cool bookcase via houzz. Ah yes, storage and small spaces. Often an issue in small spaces when looking to conceal all of your things. Instead of stuffing away everything, think about what you have and consider showing it off. I am loving these drawers-turned-bookcase. 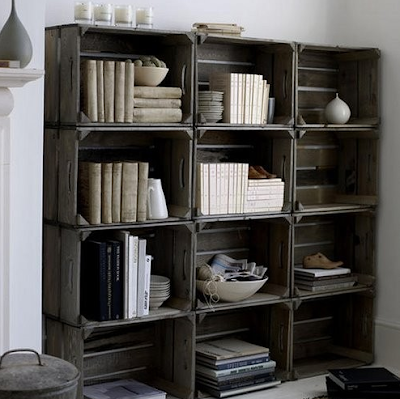 This is a resourceful idea to reuse salvaged items and storing books and accents. I could also see this in a bedroom for clothes. You could attach a rod at the top and hand a patterned curtain to make your own armoire. Love the dark rough colour of the crates and how they looked stacked.